High upon the road of distinguished sons stands the name of John Louis Taylor, a native of Ireland. Taylor was an American jurist and first Chief Justice of the North Carolina Supreme Court. Born in London, he is the only foreign-born Chief Justice in state history. He was brought to America at the age of 12 and attended William and Mary College. Taylor was elected to represent Fayetteville, North Carolina in the North Carolina House of Commons from 1792-1794. He married Julia Rowan, daughter of Colonel Robert Rowan. She died at the age of twenty-one, leaving a daughter who married Major Julius Sneed of Salisbury. He became a state Superior Court judge in 1798 and turned over most of his law practice to his brother-in-law, young William Gaston, who later became a North Carolina Supreme Court judge and U.S. Congressman. Before 1818, several North Carolina Superior Court judges met en banc twice each year, to review appeals and disputes from their own trial courts. This was eventually called the "Supreme Court." Taylor sat as part of this Court often and in 1810 was chosen as its Chief Justice. When the North Carolina General Assembly decided to create a full-time, distinct Supreme Court in 1818, the legislators chose three men to make up the new Court: Taylor, Leonard Henderson, and John Hall. The three met and elected Taylor to once again assume his title of Chief Justice. He served on the Court until his death, near Raleigh, in 1829. Taylor is buried in Historic Oakwood Cemetery. 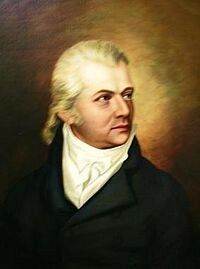 Taylor was a prominent Freemason and served as Grand Senior Warden of North Carolina, while William R. Davie was Grand Master, and he himself served as Grand Master from 1802–1804 and from 1814-1816.